I've been very flattered over the years to be complimented on the way I format my comics scripts. 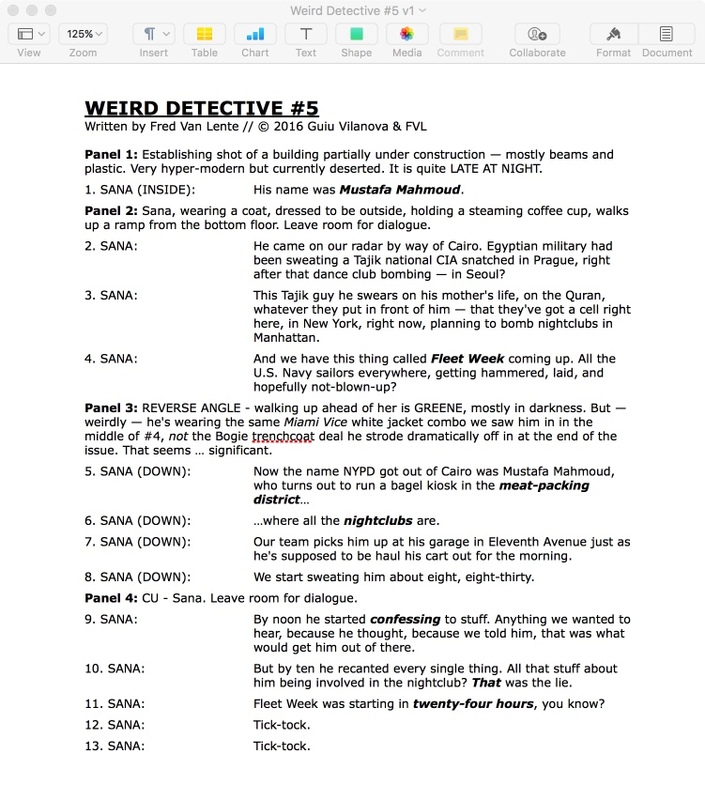 I started developing this style when I was a teenager and discovered an unpublished Howard the Duck script that one of my heroes, Steve Gerber, had uploaded to CompuServe -- this very script in fact, that a reader tracked down for me. I modified Gerber's format considerably, particularly under the guidance of Lee Nordling, my supportive editor at Platinum Studios, when we did Cowboys & Aliens together. There have been a few tweaks since then, helped, if I remember correctly, by Nate Cosby while he was an editor at Marvel. I wrote an article for Stephanie Cooke's site Creator Resource about why I format scripts this way and what its advantages are. So -- keeping in mind there is no "right" or "standard" way to format a comics script -- here's templates on how I do it. This is what I think is the easiest-to-read and the most efficient format for the pencillers, inkers, colorists, letterers and editors to get the information they need to complete an issue. Remember, save them to the "My Templates" folder in your Office Library or they won't show up in Microsoft Word's Project Gallery. For more information on writing comics -- not to mention drawing, inking, coloring, lettering, editing, pitching, publishing, and marketing them -- pick up Make Comics Like the Pros by Greg Pak and I. NEW AS OF MARCH 2018! I added a template for Pages if that's your jam. Don't email or tweet me for technical help. I'm not qualified to come to your aid. Fair warning! ACTION PHILOSOPHERS: "Immanuel Kant" Script / Copyright 2006 Ryan Dunlavey & Fred Van Lente / Read the completed comic here. All Contents Copyright Fred Van Lente - All rights reserved.